as Round One of the All England One-Act Theatre Festival. The Festival will be held at Chipping Sodbury Town Hall on March 7th - 9th. 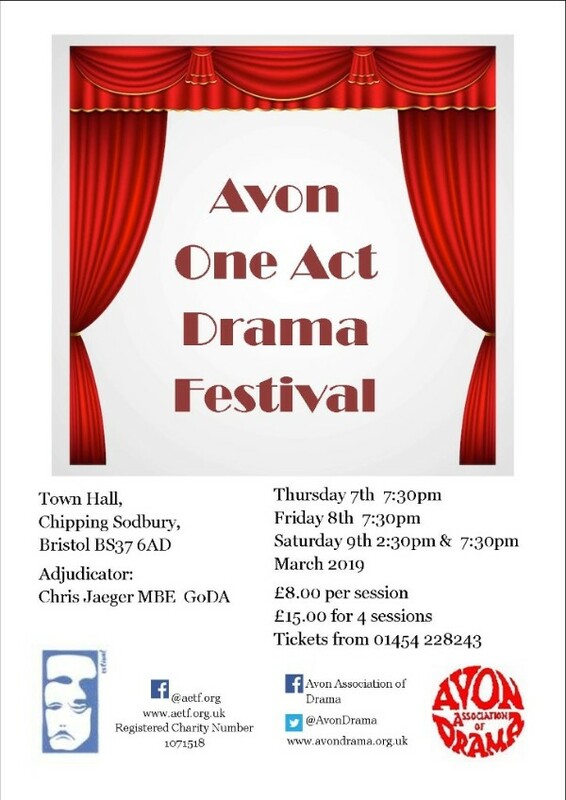 Our Festival is a preliminary round of the AETF (All England Drama Festival www.aetf.org.uk) and Sodbury Players who will be hosting the event are a thriving and hospitable company. We are also very lucky as having Chris Jaeger MBE, GoDA as our adjudicator - he is a warm and encouraging personality as well as immensely knowledgeable. These Festivals are a great opportunity to try out scripts that may not be ‘bums on seats’ as well as genres you are familiar with. They are also an opportunity for original scripts - and new directors. We all enjoy watching other companies, noting their strengths and their problems and when listening to the adjudicator learn from his assessment of their performances. The Festival flyer is below and you can get a Part One Entry Form from this link - Part One Form. From this you will see that the Part 1 does not even have to state your play - just an intention to enter. Hopefully this will encourage you to try the festival scene - or at least come to Chipping Sodbury - we would be very glad to welcome you there . If you have any queries please feel free to email us! The Avon One Act Drama Festival is a member of the National Drama Festivals Association (NDFA) and our winners are eligible to be invited to their annual British All Winners Festival and original plays can be entered for The George Taylor Memorial Award.